How does one ﬁlm encompass a person’s life? Specifically, what approach is best suited? A narrative ﬁlm is traditionally expected to be two hours long, so a lot of ground in a biopic (biographical picture) will either be skipped, glossed over, or shortened as possible. One example a ﬁlm will take is combining several characters into one or even eliminating characters. Screenwriters Scott Alexander and Larry Karaszewski understand that. Their screenplay for The People vs. Larry Flynt takes the titular character’s two lawyers in real life and combine them into one played by Edward Norton. Bela Lugosi’s wife Hope Lininger, whom he was married to after his recovery to a Demerol addiction, wasn’t mentioned in their Ed Wood screenplay. Mr. Alexander and Mr. Kraszewski understand that it’s not necessarily about how accurate the ﬁlm is about the truth but about making the ﬁlm interesting to an audience; to treat the subject matter as if no one doesn’t know who they are or why their story is being told. It’s why it’s incredibly sad to say that James Marsh’s The Theory of Everything not only fails as a narrative ﬁlm but also fails at portraying Stephen Hawking’s life as interesting. A question is raised right off the bat. Was Stephen Hawking’s life interesting? If not his entire life, what about a specific part of his life? The ﬁlm goes with the latter, beginning in 1963 at Cambridge University with his courtship of of Jane Wilde, developing ALS, and concluding with the separation of the Hawkings and Stephen refusing knighthood from Queen Elizabeth II. During the 123 minute running time, Stephen Hawking’s condition worsens to the point of losing the ability to move and speak, but he continues his research in physics, culminating in the release of his pinnacle book, A Brief History of Time. Stephen Hawking was, as told to us by Anthony McCarten’s screenplay, a genius. But therein lies an unfortunate misstep the ﬁlm takes: we’re told why the subject matter is brilliant or important, but never are we shown his brilliance. I think of how The Aviator, directed by the impeccable Martin Scorsese, handled Howard Hughes’ brilliance and his OCD taking over his sanity. Through the making of Hughes’ Hell’s Angels, testing the H-1 Racer, his purchase of TWA, and his life depending on the success of the Hercules aircraft, we are shown rather than told through Robert Richardson’s Oscar winning cinematography and Thelma Schoonmaker’s Oscar winning ﬁlm editing how important these events are. Because it feels important to the characters and the world they’re inhibiting, it feels important to us. One character meets Stephen Hawking for the ﬁrst time and then says he’s the most brilliant man she has ever met, in spite of the previous scene offering anything to back up her assessment. Once again, we’re being told rather than being shown. The Theory of Everything makes a logical error in both dumbing down Prof. Hawking’s teachings through poorly done exposition and not once making it feel important to the characters; it takes a step back to the love story. 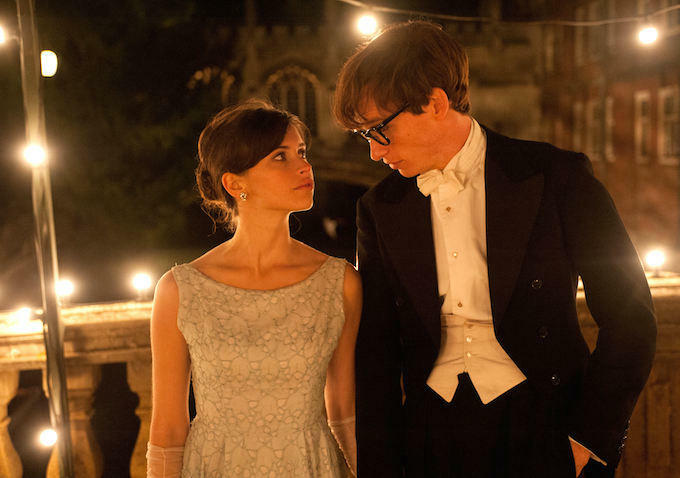 Since the ﬁlm doesn’t care for Prof. Hawking’s ﬁnding and would rather tell you that he’s brilliant and just move on, how does the love story fare? Abysmally. Stephen Hawking and Jane Wilde fall in love because…because. The ﬁlm fails at even presenting us a reason why they fall in love other than they’re pretty and she cries. Yes, Felicity Jones is a beautiful woman and a talented actress, but she’s given nothing to do except stand there and exist. Eddie Redmayne, who won the Oscar for Best Actor for this performance, fares slightly better. The Tony award winner shows his total commitment to the physicality of the role that does recall element’s of Daniel Day-Lewis’ Oscar winning turn in My Left Foot. However, the major ﬂaw in Redmayne’s performance is that he fails at making Stephen Hawking a compelling character to watch. It doesn’t feel like we’re watching a real person we can sympathize with but an object that we are meant to feel for just because he’s handsome and he has a horrible disease. To do this with a subject matter as brilliant as Stephen Hawking is unforgivable. Another important character to mention is Jonathan Jones (Charlie Cox), a widower that Jane meets at a church and begins to have feelings for him. The ﬁlm delves into the possibility that they have an affair but never reveals if they did or didn’t, taking this whole escapade into Three’s Company territory. Later on, Stephen begins to have feelings for his caretaker, who is never treated as a person but as a cheap excuse for the Hawkings to separate and for Jane and Jonathan to become a cute couple again as light beams through the church, which feels cloy and manipulative, rather than heartwarming and touching. The ﬁlm makes a poor attempt to go into a debate on the existence of God; Jane had a strong Christian faith while Stephen was an atheist. These scenes ring very false due to how poorly developed the characters are. Once again, we are told what they believe in instead of feeling it. It’s an interesting subject matter for the ﬁlm to dive into. The idea of an existence of a higher power and the relationship it has with scientiﬁc discoveries. Can they both coexist together? Once again, the ﬁlm cares very little for a good debate and rather focuses on the E! True Hollywood Story account on the marriage of the Hawkings. Film is a visual medium and in the case of The Theory of Everything, Benoit Delhomme’s cinematography utterly fails. Many scenes alternate between blue, red, yellow, and orange ﬁlters without any rhyme or reason. One scene utilized a green ﬁlter that made Jane Wilde look like the Hulk. Using ﬁlters just for the sake of using them doesn’t make for a unique ﬁlmgoing experience but one of utter frustration. It culminates in the laziness of the recurring motif of home videos of the Hawking family. The execution is quite laughable to the point that stretches of the ﬁlm is dedicate to white people frolicking in the forest. I go back to Martin Scorsese and how he utilized the home footage motif for Raging Bull. He uses the footage of Jake La Motta, his wife, and his brother and cross cuts it with Jake La Motta’s successful boxing career; we understand clearly how important La Motta’s family and career is to him and how ultimately, both cannot successfully exist together. James Marsh, who directed two wonderful documentaries Man on Wire and Project Nim, has shown in his award winning career how important it is to successfully match images to information. And yet he is hopelessly lost in his transition back into narrative ﬁlmmaking. Ultimately, it comes back to the question of whether a person’s life (or one particular aspect) is worthy of a narrative ﬁlm. I think of Fruitvale Station, which portrays the last day of Oscar Grant III in an 85 minute ﬁlm. Oscar Grant III is not as important of a ﬁgure as Stephen Hawking, but the ﬁlm does a brilliant job of inviting you into Oscar’s life and his family and when the tragic events occur, you feel it hit like a ton of bricks. It comes down to execution and how one wisely can convey a real life person’s to be relatable. In the case of The Theory of Everything, it feels as if I’m in a poorly taught college class being lectured on the importance of Stephen Hawking but never feeling why he was important. 1. What was it life for a one-in-hundred million genius to be married to someone who (despite being quite intelligent) can’t possibly compare to him in the IQ department, and can’t understand his work beyond the basics? 2. Why was she so attracted to him in the ﬁrst place, apart from his intelligence? 3. When a deeply religious person is married to an outspoken atheist, how does it work? Did he respect her beliefs? Did she believe that she’s heaven-bound, but her husband isn’t? 4. What kind of emotions are involved in having a child when you’ve been told you’ll be dead before his kid is a toddler? What made them decide to have children under those circumstances? 5. How do you maintain a friendly relationship with someone after you’ve spent years as his caretaker, and you’ve turned away someone you had feelings for, and then he dumps you for his nurse? If the ﬁlm was more focused in the handling of the story with a mature hand, these points would’ve been more properly addressed. As is, we have a poorly done biopic that would rather manipulate the audiences to tears rather than transcend the material. At the end of the ﬁlm, Stephen Hawking looks at his three children with Jane by his side and says, “Look what we made.” The funny part is that the children in this ﬁlm have been given no more than ﬁve words of dialogue. They are soulless. As far as continuing to have other folks stuff hosted here, I say Hell Yeah. I hate to sound ungrateful (cos I’m not) but more authors means more posts, and more posts means me reading more, and me reading more means me happy. There’s a few things I’d change about this sentence, but the most glaring is the word missing in the last 4 words. “or AS shortened as possible.” Second, I’d suggest using the full name “biographical picture” and THEN adding the shorthand version “(or biopic, for short)” and then continuing to use the shorter version from there on. If a reader doesn’t understand/know the shorter version, putting the short version first will break the flow, rather than informing the reader, then informing them AGAIN by teaching them the shorter version. Plus, I’d suggest adding “around” or “about” before making blanket statements like “traditionally expected to be two hours long”. Just reads better, in my opinion. There’s a fair few times you’ve missed words or used the wrong ones, and I think a reread (a day or so after you’ve finished it) would catch a bunch of them. But you’ve got a nice, clean voice in your writing and I’ve no doubt you’ll get even better. That’s on me for sure. David was kind enough to shoot me something to carry me through an otherwise quiet week, and I didn’t have the time to give it the editorial attention it deserved. If there are distracting errors I take responsibility for that. Just providing feedback which, I hope is, useful. While the review of the movie is negative, my review of the negative review is positive. I’m simply positioning my positive (with a purview to prohibit my penchant for posturing) so as to potentially prepare my peer’s potential positioning upon the Noiseless Chatter posting population. Oh god. I wrote that, now I hate it, but I can’t delete it. First I must advise that I am David’s mother. Having acknowledged this I can honestly state that I am very impressed with this review, and agree with RaikoLives: David, you do have “a nice, clean voice in your writing.” This was informative, interesting, and very well-written.